Boooo, I didn’t get to use the Hail-Fire. Hey guys, pardon the lack of posts in the last couple of days. Summer School has been keeping me a bit busy, in addition to trying to make a recap post of the game, editing some game footage together, and trying to arrange the screepcaps in the right order. I’ve highlighted a couple of my favorite screencaps from the Facebook album I uploaded. Check them out below! Also without Coop of Click Click Bamf recording video, almost none of the screenshots would have been possible to grab. Thanks Coop! Just a small update from my video that came out last year. All this stuff is contained in 4 bags and a box, so I’m pretty much ready to transfer my Nerf stuff right away if needed. 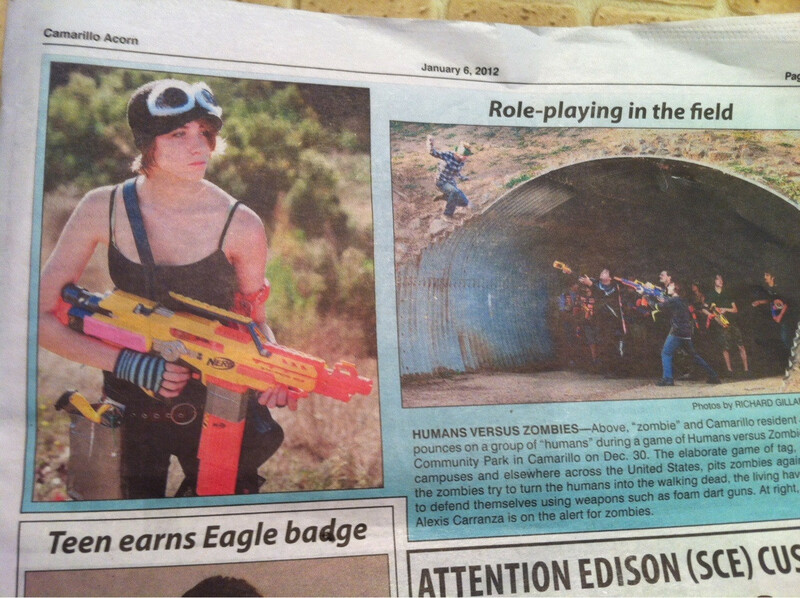 I have finally put up a video on my Nerf War and Humans vs. Zombies planned loadout for this summer’s upcoming game. Check out the video and then help me out if you can. 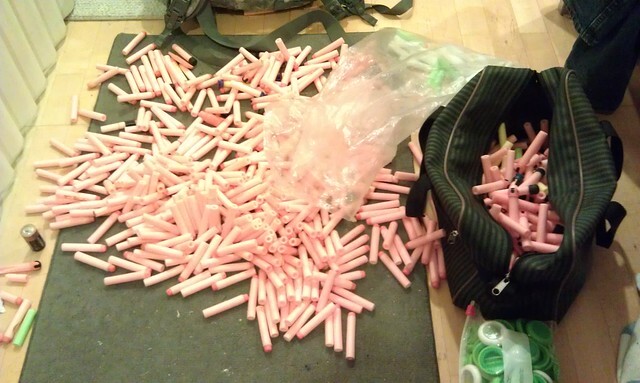 I’m planning on carrying 6 18 dart clips, or 108 rounds of foam. Is that enough for the day long game of HvZ? Also I’m trying to think of something, or somethings, to put into the right chest rig pocket, but I’m not sure what to include. More socks, or numerous supplies such as my multimemter, a screwdriver, or even food or drink come to mind as well. Also, according to one of the mods, if the blaster leaves a mark, or even worse a welt, they reverse the right to not allow the blaster for the game. My 12.4v Rayven doesn’t leave any marks, I’ve even tried firing tests on myself from 5 feet. Theres also a good chance that waivers are going to have to be signed, which is fine in my book. The mods still haven’t put that up yet, or the game rules. Hopefully they get them up in a week or two. Original Post was on Reddit. I believe the photo was taken by the girl there, but I’m not sure. Also I added her on Facebook and invited her to the game, but she declined the invite, guess shes busy or something. Also, according to a mod for that game, he says that 67 people went, which is the second largest game in their history. I wonder if we can break it this summer? Never in my life have I been so excited for AA batteries. It’s been almost 3 weeks since my last update on this, and a good amount of things(6 to be exact) have been completed for the game. 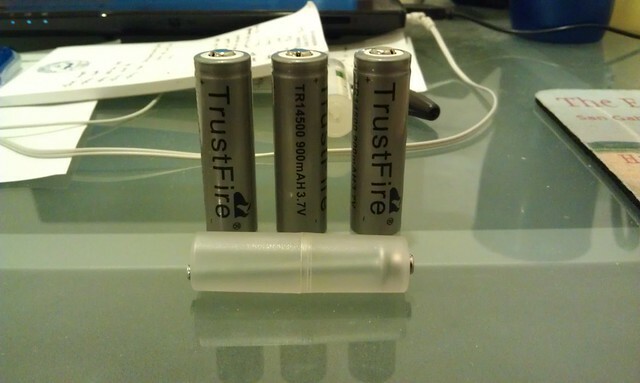 First things first, and possibly the biggest thing, is that I received my Trustfire batteries in the mail this Friday. I wasn’t sure if I was going to actually get these. I placed an order for them on the 10th, and then the United States Post Office announced a sort of ban on shipping/receiving Lithium Ion Batteries on the 11th. The interpretation wasn’t clear to many people, including myself. After saying a few prayers, they came in the mail, and wow do they make a difference. 60-70 feet, a higher rate of fire, and a seemingly easier trigger while doing zero work is great. I did a decent firing test, going through 3 18 dart clips (54 darts) with the Recon barrel and then with the Spectre barrel on. The Recon barrel is a little longer and thinner then the Spectre. You got a noticeable better grouping and “accuracy” with the Recon barrel on. What I mean by accuracy is the Recon barrel’s center where the most of the darts landed was about 60 feet out there, pretty much in a straight path. When I fired from the Spectre, some of the darts went farther (in their awesome Streamline flying path) more of the time. BUT the majority of the dart’s center was about 60 feet out, two steps to my right. So it looks like I’ll be rocking a Recon barrel for my future Rayven usage. I just need to find someway to make it look less lame. I’ve done a decent amount of online and mouth to mouth advertising, posting on Nerf Haven, Nerf Revolution, Foam Universe, Adult Fans of Nerf, Reddit, posting on my blog, and the HvZ Forums. I’ve also sent a message to Vanguard University’s (they play there) student site called “The Voice” but no answer yet. I’m also planning on send messages to the students Azusa Pacific, Pasadena City College & Cal Poly Pomona. These three colleges can only use socks in their games. 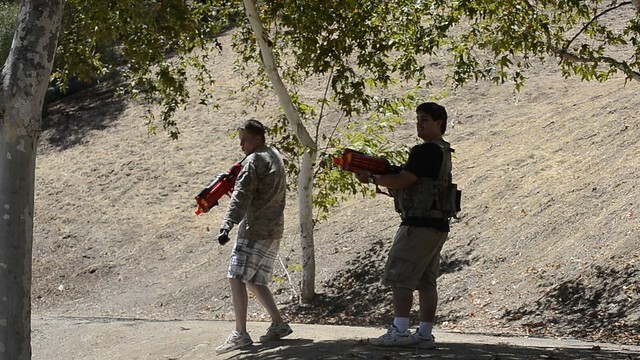 Adult Fans of Nerf have a web video series, and I’ll be asking my affiliates to make an announcement there as well. I’m still reading the Art of War, chapter by chapter. A lot of times I have to stop, think about what I just read, and ponder on how I can apply it to my line. Sometimes, I go back and read things again. As you can tell, it can be very time consuming. My Nerf Tactical Vest has been replaced by a chest rig. I want to keep it a surprise, but I’ll be sure to reveal it in the weeks to come toward the game. I also recorded more GoPro videos with my friends. We played all Siege once again, and I used the Rayven and my new chest rig, so I have a decent idea on what I need to change and edit with my chest rig usage and loadout. Keep a lookout for those videos this week. Theres 55 days until this HvZ game. The days can’t come fast enough.